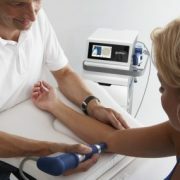 Radial Shockwave Therapy is a modern and effective non-invasive treatment for a wide range of common tendon problems. 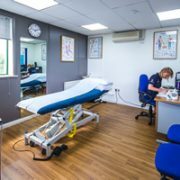 At The Physio Clinic Bristol, we have been using it for many years with good effect to treat chronic and long-standing conditions. This includes tennis elbow and Plantar Fasciitis, which have not responded to other modes of treatment. Shockwave is an acoustic wave which carries high energy to the painful tissue, e.g tendons. This energy promotes regeneration and reparation processes to the painful/injured tendon along with your own natural healing processes. What areas of the body can Shockwave treat? Shcokwave treatment is supported by NICE (National Institute for Health and Care Excellence), the Governments Health watchdog, and current research reports success rates between 65 and 91% in reducing patient’s pain and symptoms after a course of 3-5 sessions. There is usually some discomfort, but most people can tolerate it during the treatment and there is no need to worry. There are very few adverse effects unlike injections or surgery, making shockwave therapy a very compelling therapeutic modality for the treatment of chronic tendon problems. We advise, after treatment, refrain from intense activities that stress the treated area for the next 48 hours. What if the treatment doesn’t work for me? As with any treatment, individual responses will vary according to severity and overall management of your condition. The normal response to shockwave is exceptionally good within a few weeks, however it may take several months before maximum effect is achieved. If after 3-4 months you do not experience a change in your symptoms, then you may be referred onwards to a surgeon depending on your clinical presentation. Shockwave is from £65.00 per treatment. Prices vary depending on treatment time and areas being treated. Please call us if you are considering Shockwave Treatment on 01454 854466, so we can advise on a treatment price and plan.